Parody accounts on Twitter were once the stuff of brand nightmares - but companies can learn from successful satire, writes Lee Cassanell, editor at We Are Social. God is on Twitter and he has 1.5 million followers. Not that many, considering his pedigree, but with a book deal in the bag and an average of four thousand retweets a day, his social media power is nothing less than biblical. It's fairly well known that God is the creation of American comedy writer David Javerbaum but there are other, more mysterious figures on Twitter playing the parody game and their reach and influence is growing by the day. Even I can't delete this frigging U2 album from My cloud. I’ve always been a fan of satire. I wrote a popular satirical newsletter during my college years and I had my own column in a free magazine up north that achieved a certain degree of notoriety and became a big draw for local advertisers wanting to showcase their wares to an alternative audience. But I wanted to take it a step further. I got talking to another writer who wrote for the same film blog as me. We tossed around ideas and before the week was out, we'd created The Studio Exec, a fake Hollywood producer who makes fun of an industry ripe for parody. Since then our tweets and articles have been picked up by most International newspapers and magazines. We fooled Le Monde and Le Figaro into believing Hollywood was going to make a movie based on the song Gangham Style. We cajoled the director William Friedkin into denying that he wanted to use the Pink Panther theme instead of Tubular Bells on the soundtrack for The Exorcist and Spike Lee threatened to sue us when he temporarily forgot that he had a sense of humour. The Studio Exec does okay but there are a legion of other parody accounts out there with huge and influential audiences. 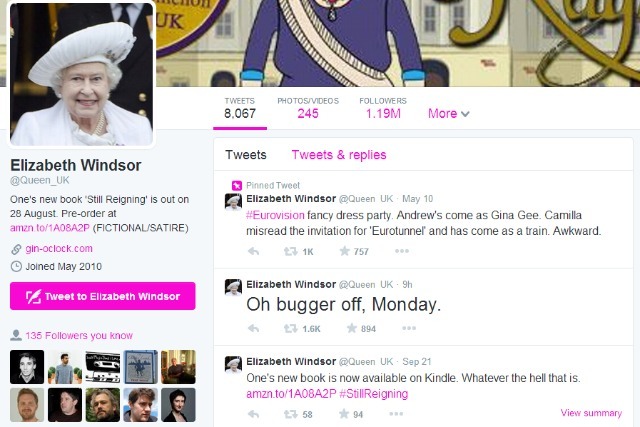 The Queen has around 1.2 million followers and has published a popular book, Shortlist's Online editor Benjamin Lee created the popular Michael Haneke parody account and has moved on to Middle Class Problem. The majority of these parody accounts are run by highly skilled writers and social media professionals and many choose to remain anonymous because it gives them the flexibility and freedom they lack during their day jobs. From a marketing perspective, anonymity and anarchy are a scary combination. But as brands become increasingly comfortable using social media, working with a parody account should not be as intimidating a prospect as it has been in the past. Approach a parody account in the same way you would approach a blogger relations campaign. Is your product relevant to the parody? Could you genuinely see the fictional character using, eating or drinking your product or service? Some of the best approaches we’ve had at Studio Exec, for example, have been from manufacturers of tequila and cigars - products that fit perfectly into our character's lifestyle. Why deal with these delinquents when you can work with a legitimate blogger or celebrity? Put simply, their illegitimacy makes them attractive to both the mainstream and the counter-culture. Brands also can take inspiration from parody accounts and create their own. Heinz ran a campaign last year with a tweeting Salad Cream bottle, commenting on lunch options. One of the biggest recent successes of a product parody is adidas’s tweeting match ball, Brazuca, which hit just the right informed, but irreverent, tone-of-voice and became the fastest growing Twitter account during the 2014 World Cup. The success of parody accounts should also tell brands something about their approach to Twitter - don’t take yourself too seriously. Brands like Tesco Mobile and Greggs have both been applauded recently for taking a self-deprecating approach to social or resolving a potential PR crisis with a smile on their face. Everyone loves a rebel; especially a rebel that makes them laugh and these entertainers are conjuring up exceptional comedy on a daily basis. Funny sells, ladies and gentlemen, and if you're willing to take an educated risk and get involved with some of these characters; the parody game could be well worth playing.